8 asparagus spears, ideally thick asparagus. Now pre-heat your oven to 190*c.
Cook your asparagus in boiling water for 2 minutes, drain and refresh under cold water. Wrap half a slice of Parma ham around each piece of asparagus. 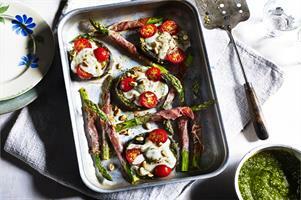 Place the mushrooms onto a roasting tray, spread 1 teaspoon of the pesto all over the mushrooms. Add a slice of the mozzarella and 3 halves of cherry tomato, season with a little milled pepper. Place the asparagus next to the mushrooms and place the tray into the oven and cook for 10-15 minutes. Serve with a little extra pesto on the side, some fresh rocket and if you fancy a little scattering of the pinenuts and parmesan cheese.